I love my Boogie Board! I know, what your thinking. What is a Boogie Board? 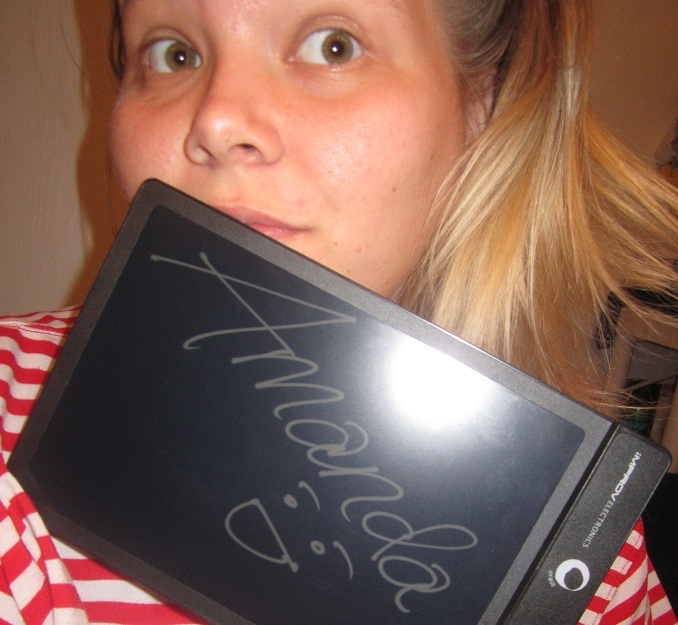 Well, it's this awesome LCD Writing Tablet. You wouldn't believe how much it can be used for! You can use it to write down notes, you can write your grocery list on it.. Anything! Well, with the Boogie Board from Improv Electronics, I never have to waste another piece of paper, on notes again. As soon as I think of something, I just take it out, and write it down. It also runs on a 3v watch battery, so it never needs replaced - So you aren't wasting on batteries either! There is also a tablet for binders, so Boogie Boards are also perfect for school! Just hook the Boogie Board in to your child's binder, and then they can easily write down homework assignments, or work out problems! 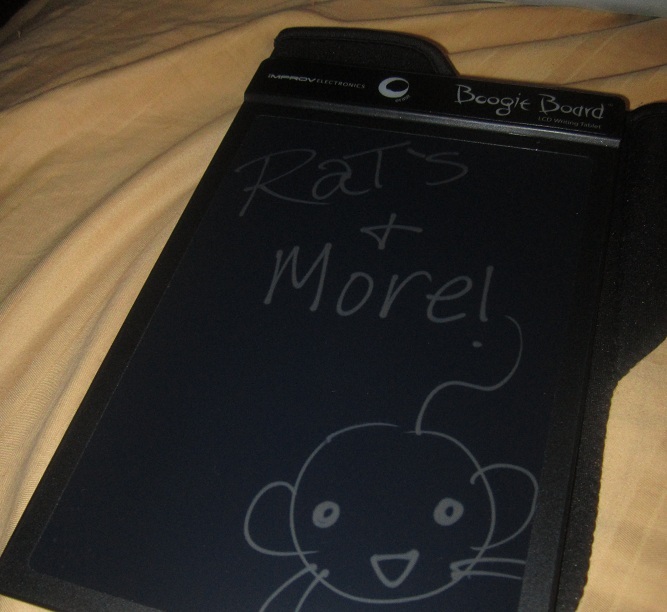 I've had so much fun with my Boogie Board! The first day I got it, I was driving Aaron insane. Every single time he'd talk to me, I would only respond Via writing communications through the Boogie Board - I had a blast! You write with a stylus, and it writes so smooth! The tablet is slim, and small, so I can easily fit it in my purse, or I can easily just carry it around with me. 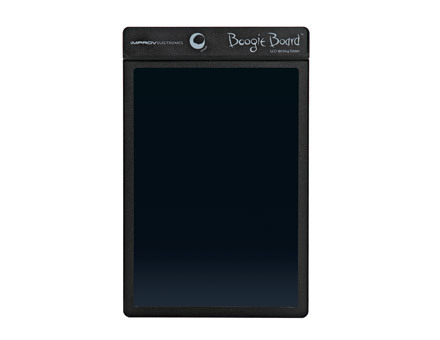 Personally, I think the Boogie Board is great, and I would highly recommend it! 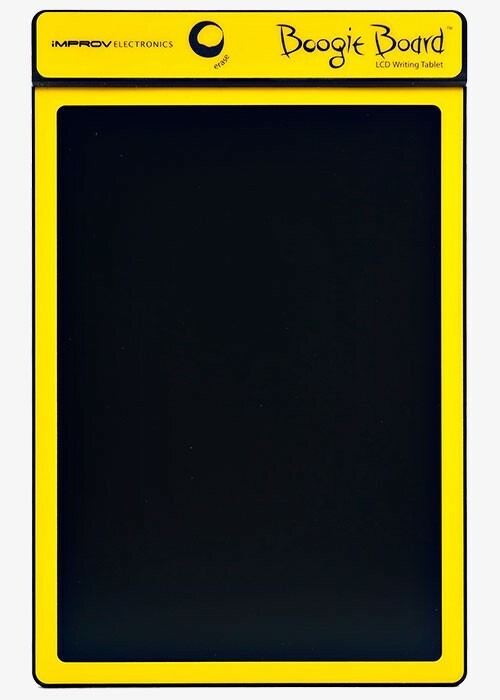 1 of you will win a yellow Boogie Board 8.5" tablet, and a magnet kit stylus holder! Disclosure: Review product was provided to me free or charge. All opinions expressed are my own, and were not influenced in any way. Facebook is not involved in any way. This giveaway will end on October 7th, at 11:59pm. Winner is drawn via Random.org. I am your newest follower from the blog hop. Please come check out my blog as I am doing a giveaway--you could win a free flower ring! I do not have a lot of comments yet so make sure you come check it out! I would appreciate if you followed me back! I'd like to give this to my 17 YO daughter for her school work. I so want this for a Christmas gift for my hard to buy for daughter! I would love to win this! I hate wasting paper for notes. Hi this is what i need. I write stuff down like food list and then get to store and then can't find it. Now my memory is playing tricks lol on me and can't remember what i was going to do that i needed to do that day. I WANT THIS!!! can't help it this thing is cool. Thanks Joannie jscddmj[ay]aol[dot]com I am posting anonymous cause i am having trouble with google. I think the Boogie board would be very convenient to use while I'm out or at school. it saves paper too. I would love to have one of these because I have a horrible memory and I constantly have to write things on my hand to remember. If I had one of these to carry around it would be so much easier! I'm in math and I waste billions of sheets of paper writing down the wrong solutions. 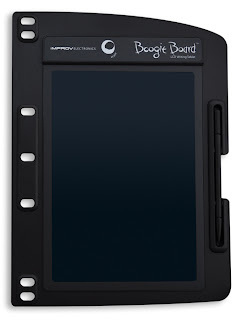 Boogieboard would save countless trees from my math blunders. 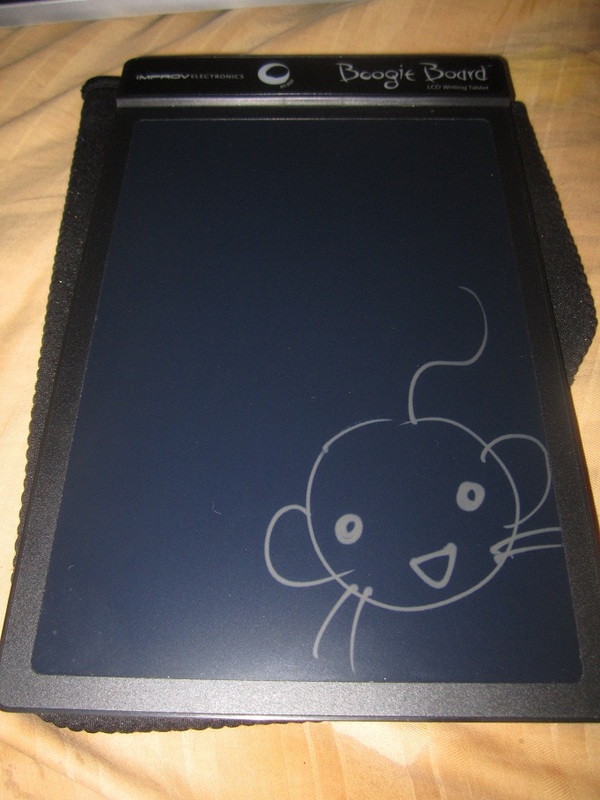 Also, I would draw pictures on it. 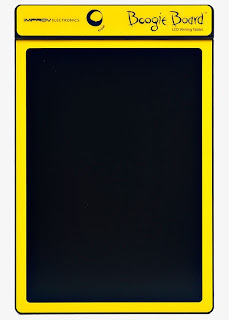 I would love to win this because I can never find paper when I need it, and it's economical and ecological. i think this is awesome i would love to have it just to doodle on.. I'd like the Boogie Board because like you I frequently write notes on little pieces of paper that I often forget about, or lose, or toss away a few minutes late. It's such a waste. This would cut down on that and be so convenient. I really struggle with having my grocery list or any important notes easily accessible to, especially when I need them the most, so this would really help me. I'm not good with using my cell phone for such things either. This would be perfect to help me keep up with my to-do lists, too, which I have recently had a hard time staying caught up with. I would like this because I am always writing down nail polish shades that I want on scraps of paper then can never find them when I get to the store! I'd like to win this for my teen daughter. She will be going to college the year after next and it would come in really handy for her I think. My grandson is very creative & would enjoy this so much, it would cut back on the amount of paper he uses! 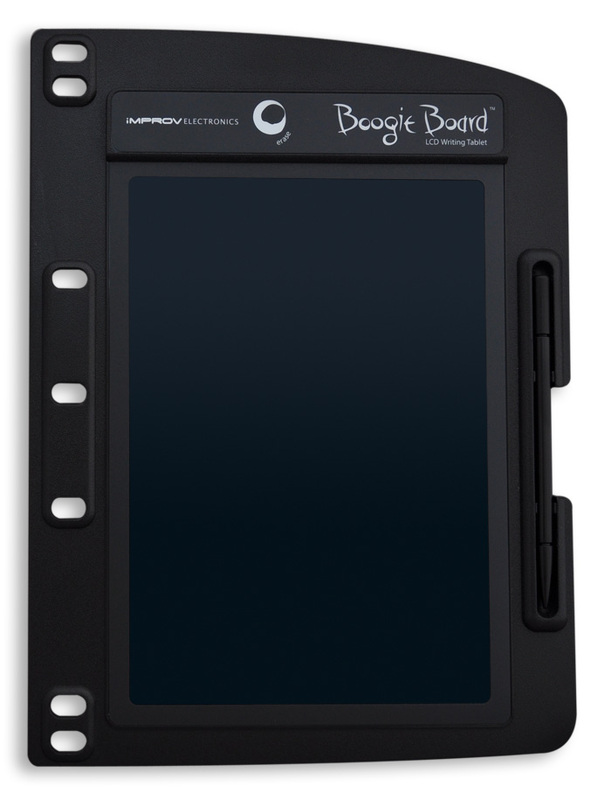 I want the Boogie Board because it would eliminate 5,665,154 pieces of paper that exist in my house to date. I collect toys for Ronald McDonald House and this would be fun for one of the kids. I would love to win this because it would be great to keep by my computer to jot down notes and phone messages.